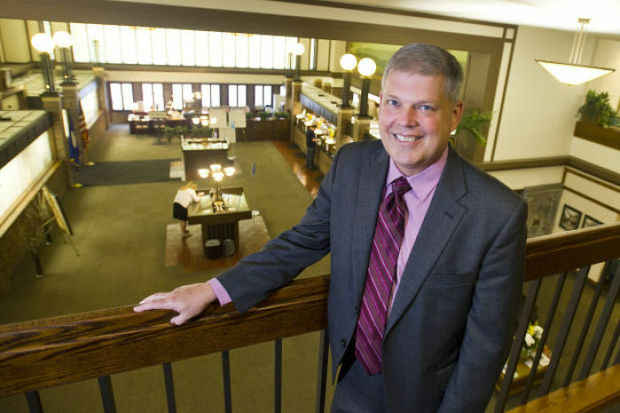 That might be a good way to describe new Merchants Bank president Greg Evans, but it’s not the only way. Winona native is another. So is Steamboat Days harbormaster, 10 Days of Giving founder and community leader. For his father, Gary Evans, another native and Winona business and community leader, when he talks about his son, it’s about how he has stepped into his own and the mark he has left on the community. Community is important to Greg, who cites Gary and Merchants Financial Group CEO Rod Nelson as mentors and people who have instilled the importance of community in him. Merchants’ philosophy is that a strong community translates into a strong community bank, and Greg is a follower of that philosophy. After studying journalism in college and a short tenure as a reporter in Iowa, Greg came back to Winona and joined Merchants Bank in the late 1980s in marketing. One of his first projects at the bank was starting the annual 10 Days of Giving food drive, which celebrated its 25th anniversary last winter and has brought in hundreds of thousands of dollars and millions of tons of food for the Winona food shelf. Nelson said the 10 Days of Giving was a prime example of how Greg leads by example, and called the growth over the years of the program a testament to his passion for the community. Greg was involved with a number of community events and organizations during his time in Winona, capped off — literally — with being named Steamboat Days Harbormaster in 2007. Later that year, he was promoted to be Merchants regional president for the bank’s newly acquired Cannon Falls division, and Greg began to build ties in his new home. That, of course, meant community involvement. Greg’s wife, Terri, is a leader with the Cannon Falls Education Foundation. Greg got involved with the Cannon Falls Rotary Club and the Goodhue Habitat for Humanity board, among others. Greg said he never really had a strategy to come back to Winona, but the chips fell in place last year when he was chosen to replace Rod Nelson as bank president. It wasn’t an easy decision after seven years of building a home and community connections, and Greg said he initially thought Cannon Falls might be the last stop in his career path. The transition to Winona is smoothing out, as Greg bounced between the two cities as he looked for his replacement for Cannon Falls. His family is still working on selling the old house and getting one in Winona, but in the meantime has moved from a hotel room to apartments near East Lake Winona, which he appreciates for the beautiful view and quick access to the running path. Evans said the transition won’t really sink in until after he’s unpacked and settled in, but he said one thing didn’t require a transition — falling back in love with his hometown. The Winona community and its beauty is a tremendous draw, and he’s glad to be back, he said. While Greg and Gary were never strangers during his time in Cannon Falls, the elder Evans is glad to have his son back in town. He’s proud of all his son has accomplished, and said he knows Greg has a deep love for Winona and that commitment to the community and its people shows in his endeavors. Story by Nathan Hansen. Reprinted with permission from Winona Daily News. This entry was posted in Current News and tagged Employee News, Merchants Bank, nonprofit support. Bookmark the permalink.